Tara and I have been invited to take part in this year’s Holiday Blogging Project called Oh Tannenbaum! The idea is to investigate perfumes inspired by trees and wood. This is a genre I like a lot, but it has still been a challenge to find something suitable in my collection (that I haven’t reviewed yet). But I found something amazing (one old, one new) and so did Tara. 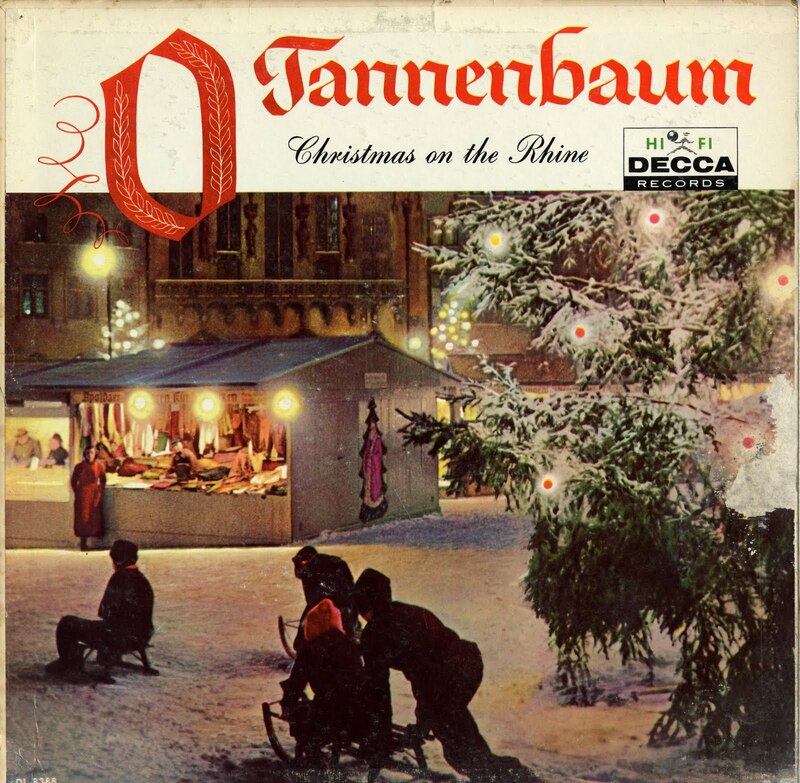 So without further ado – join us in celebrating the Tannenbaum! 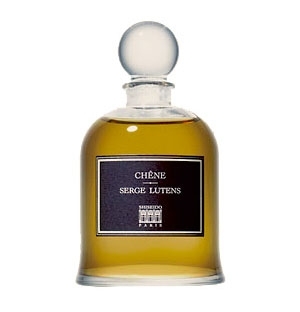 “Gentleman’s comfort” are the two words the Serge Lutens website has to say about Chêne. Well, I’m no gentleman, but I like to be comforted, so let’s see whether Chêne is capable of what it promises. Notes include cedar crystals, wood sap, black thyme, oak, immortelle, beeswax, silver birch, rum absolute and tonka bean. It was created by Christopher Sheldrake. Chêne is a dry woody scent, that still bears traces of the Lutens trademark oriental fruit stew with the idea of leather swirling around the edges. Very linear and to the point, Chêne reminds me of traditional leather chypre scents, but in a very wearable, and – yes – comfortable way. I get the feeling of standing in an old empty closet, maybe one old fur coat with leather trimming is still in there, way in the back. I feel a bit like I’m looking for the door into Narnia and I have to say, I love that feeling of anticipation and excitement of hoping or secretly knowing that there is more to this old wardrobe, than what might meet the nose. The closet gives way to the forest eventually, the dank mossy earth, and the tall oak trees surround me and I know I finally found that door. Every time I think of Bois d’Armenie, in my mind’s eye I see a striking looking woman swathed in a luxurious dark wrap, emanating an air of mystery. The fragrance is uncommonly beautiful, soft and ethereal. It is inspired by Papier d’Armenie; paper infused with benzoin which is burnt to release the scent. Most recently brought to the fore in Prada’s Candy, benzoin is a tree resin with a pleasant balsamic, vanilla-tinged aroma. While Bois d’Armenie is not what you’d call a multi-dimensional perfume, it does create a beguiling personal aura, encircling you closely with its slightly powdery, resinous warmth. Beyond the benzoin, it reveals gentle woods, delicate wisps of smoke, and a creamy vanilla base. It is more in its creator’s style – Annick Menardo – than Guerlain’s, but it is none the worse for that. A comforting yet sophisticated woody oriental perfume, Bois d’Armenie is more than worthy of a place in “L’Art et la Matière” and is my favourite so far in this exclusive collection. Notes include pink pepper, iris, rose, coriander, benzoin, Indonesian patchouli, incense, precious woods, musk and balsams. Bois d’Armenie is available as a 75ml EDP. Armani Privé is an expensive line, but the ones I have tried so far are exceptionally good. Sometimes high price and high quality really go hand in hand. Bois d’Encens is my favorite incense/deep in the woods smell and I love to bring it out every fall. Bois d’Encens was created in 2004 by Michel Almairac. Notes include pepper, vetiver, cedar and incense. I wrote a long review of this perfume last year, but I wanted to bring this to your attention again, because it is one of the best “scents of place” I know. Bois d’Encens has the power to transport you into the middle of a dark and still forest in the speed of a breath. Inhale and let Bois d’Encens lift you away from whatever drudgery your are entangled in at the moment. Let Bois d’Encens fill your lungs, your heart and your head with fresh air and a sense of freedom, of wide spaces and a weightless stillness that slows your life to a crawl for a few precious moments. Recharge your batteries in Armani’s Forest of Smoke. This entry was posted in Armani Privé, By Tara, Fragrance Reviews, Guerlain, Guerlain L'Art et la Matière, Incense, Serge Lutens, Woods and tagged Armani Privé, Bois d'Armenie, Chene, Fragrance, Guerlain, Oh Tannenbaum, Perfume, Serge Lutens, woody. Bookmark the permalink. The Lion, The Witch and the Closet is one of my favourite books of all time! I have trouble with cedar as a note – it can come off a bit “pencil shavings” on my less than magical skin. : – ). Bois d’Armenie, on the other hand, is a winter favourite, and I now see the link with Candy, another big love. Bois d’Incens I feel I must have tried before, but can’t bring to mind. As I have a fair bit of Christmas drudgery looming, I sense it might be just the thing for the festive season…! Happy Christmas to you both. I am homeward bound now. Have a good trip home, V! Happy Christmas to you too Vanessa! Pleased tohear you’re on your way home. I’m glad Bois d’Armenie is a winter favourite of yours. I love Bois d’Encens! It’s such a great incense, I would never wear it but I had it in candle form and it makes a great home fragrance. Bois d’Arménie is the only L’Art de Matiere that I haven’t tried (I think), but Tara’s review makes it sound like something worth trying (I do like a bit of Annick Menardo). Indeed, Tara’s review has me salivating as well, Bois d’Armenie sounds very good. A candle of Bois d’Encens must be wonderful! That was a lucky find indeed! I think there’s a good chance you’ll like Bois d’Armenie. They have it at the Guerlain counter in Harrods. I finally managed to try Bois d’Armenie and I did really like it. I didn’t get to spend enough time with it to really figure it out, but my first impression is very good. Iris Ganache paled in comparison! Oh, oh, oh it is better than Iris Ganache? I’m in trouble. I fear I won’t rest until I have most of the L’Art et Matieres. On first impression it’s better. I’ve decided that I really like Iris Ganache but the part of it I really love is fleeting, which is a shame. Bois d’Arménie has more oomph and a gorgeous, addictive smoke. I want to explore the L’Art et Matieres line but my credit card is frightened that I may love them. But Bois d’Armenie on the other hand sounds perfect. I’d be interested to hear if you do hit it off with B d’A, Ines. I hope you review it at some point. Tara, Asali sent me a sample and I just wasn’t impressed. It’s fine, but it’s not something I would ever consider buying. I expect you’ll guess it has to be Bois D’Encens for me but I also like Tsar by Van Cleef and Arpels and woody scents on the whole .Maybe I’ll make next year the year of wood scents. I love the Christmas Fayre picture. Froehliche Weihnachten . That is a great idea, to make the new year about a certain genre to explore in depth. Woody is almost my favorite notes group, right after resins. But that is truly a great woody scent, I’m glad you love it too. I’m getting old enough to not remember even what I said, that’s because I prefer to write it haha…! Sometimes to me it’s difficult where to put the frontier between ‘woody’ and ‘resinous’, but like you, I tend to enjoy more the resins than the woods (at least on me). FdB is a true love scent of my life, along with SL’s Fleurs d’Oranger and LouLou Cacharel. Now I have nearly finished my bottle. Anyway, I used to wear it layered with a honey & orange blossom body lotion that now it’s discontinued -for which I have no substitute yet-, and what I really LOVED the most was that combo effect. It worked dreamy! Reviewing two of my favorite scents makes it fairly important that I try the third you mentioned, Chene. Thanks for the reviews and have a great holiday! I’m so pleased my description of Bd’A chimed with you, dear dee. I remember that you’re fond of it. I really need to try Chene after reading B’s review and a “fortress” sounds good. As for Bois d’Encens, it’s a wonderful outdoorsy incense that I know you’d like, but a pricy perfume to fall for indeed! I’m a huge fan of The Lion, the Witch and The Wardrobe and once used it for one of my reviews, too. It’s beautifully fitting for Chene ~ I love your description, Birgit. Lovely Miss Tara makes Bois d’Armenie sound like something to die for. And since I know Carrie Meredith and Dee Howe are big fans of it, too, it truly must be! Suzanne, you must put Bois d’Armenie on your To Try list. I loved the Oh Tannenbaum! post on your Perfume Journal. As one doting Auntie to another, you really made me cry this time talking about your nieces growing up! I’m glad they’ll be with you Christmas night, have a wonderful time. Tara, you’re so sweet — thank you! Being an auntie is wonderful, isn’t it? Even though I often wish I’d had children, in many respects, being an aunt has actually been the best role for me. Doting without the discipline … gotta love it! As an aunt you never have to be the bad cop, which I hate to be, but have to. Thanks, Suzanne. I do often console myself with that idea and it’s good to know you feel the same way. Now please stop writing posts that make me teary. Well for maybe a week anyway…I love it really! Oh, which review is that? I’d love to read it! Tara made me crave Bois d’Armenie as well. B, it was the intro to Suzanne’s Tannenbaum post today, you must read it. I’ll send you a sample from my decant of Bois d’Armenie in the New Year. It doesn’t have the wow factor and is not typically Guerlain but it’s just perfect when you’re in the mood for something quiet and cosseting. Hey Birgit, it was a post on Serge Lutens Tubereuse Criminelle I did a couple years back, before you were blogging. I love the LWW metaphor too. It turns Chene from a ‘maybe try’ to a ‘must try’! I haven’t tried Bois d’Armenie or Bois d’Encens. Both sound absolutely divine, espescially the Armani. I could really use a perfume that gives a sense a freedom right now. I’m chained to my desk there days! I hope you get some time off soon! Chene reminds me a real old fashioned pencil, freshly sharpened. And that’s it. One of the nicest wood I’ve ever smelled was Fille en aiguilles from Serge L. – but then again, do I want to smell like that ? I’m not sure…, but I crave a candle with that scent… Would be the perfect Christmas candle – don’t you think ? Oh yes, FeA would be a great candle. I’m a happy camper too, with my “fresh” Double Vanille, it’s the perfume I packed in my Christmas travel bag ! I love Chene – it’s the only Lutens I own (just got a bottle last month!). And I am no big fan of woody fragrances and generally like sweeter scents, but there is something so comforting about it to me. It is very linear, and I’ve herd it layers wonderfully but I love it all on its own. There can be so much comfort in woody scents, maybe because trees have an inherent magic about them… I like to layer Chene underneath sweet perfumes, it adds a somber balance to them. The Lion, the Witch, and the Wardrobe – what a great book to use as a reference to Chene. Love me some Uncle Serge 🙂 And C.S. Lewis is an outstanding writer. I have a bookshelf dedicated to his writing. I’m not familiar with the other two perfumes, but I have Papier D’Armenie that I burn occasionally. Will put them on my to try list. What fun reading everyone’s blog posts today for the O Tannenbaum project. Of course, now I have that Christmas song on the brain, playing over and over and over……Wishing Birgit and Tara Happy Holiday!! Thank you Julie! Happy Holiday to you too! C.S. Lewis’ work is magical. Tara- your review makes Bois d’armenie sound lovely- I think I have a sample from nordstorm- will wear it tonight. I remember smelling and really liking Bois d’Encens a while ago- I think at the time I smelled it it was waaay outside my budget so I dismissed it – must revisit now. Hope you found your sample, Lavanya and that you got to wear it last night. This is a nice time of year for B d’A. Good to hear, Lavanya! Have a great Christmas break. You guys did a wonderful post and highlighted some amazing perfumes. Tara, I completely agree with your beautiful description of Bois d’Armenie, and it’s air of mystery. Thank a lot for reminding me of this mysterious woody scent. Birgit, Thanks for sharing your scent of place, I love Bd’E and its serenity. I’m glad you feel the mystery of Bois d’Armenie too, Asali. Have a great Christmas! Oh, your description of Chêne is just the gentle push forward I need to embrace this fragrance which has been on my “to-try-someday” list forever. Beautifully written and compelling– my mind’s made up! Thank you, Meg! I look forward to reading your point of view. I loved both of these reviews, and they may have just been the push (as Meg said) I needed to spend some time with Chene. Tara, your take on Bois d’Armenie has also inspired me to possibly get a sample of this. I don’t think I’d want to pay the $$ for this, but your description of “delicate wisps of smoke” in those otherwise sweetish notes roped me in. Wonderful reviews! Natalie, I have to say I don’t want to pay ££ for a full bottle either, but I’m very happy with my decant. I was so busy in the last couple of days that I just got to the Event’s posts (after struggling to finish mine before the day was over). This one is the first I read and I loved all three parts. I have a soft spot for Armani Prive perfumes but unfortunately for me I developed it by the time a couple of stores around stopped carrying the line. But I’ll try Bois d’Encens the first chance I have. Chene didn’t feel like a perfume I’d wear when I tried it the first time but your reference, Birgit, is so beautiful and vivid that I just must try it again (I have a perfect size sample thanks to Suzanne). Ha! Thanks, Undina. Let’s just say whatever you think of Bois d’Armenie it’ll be a win-win situation! I liked it on a scent strip but I was on my way to a dinner so I didn’t dare to put an unknown perfume on my skin (and they diidn’t have a vial to make mr a sample). Well, I’ll try it the next time I come across it. Thank you for joining O Tannenbaum! I loved your reviews. I’ve never smelled Bois d’Armenie, but it sounds beautiful. The other two I know I have smelled in the past but you’ve made me want to track down samples again.